A £1.5 million pound safety upgrade to the key route for northern Scotland takes a significant step forward this month (December 2007). Transport Scotland has published Draft Slip Road and Side Road Orders for the A9 Bankfoot improvement project, signalling the start of the statutory process. The planned junction improvements will incorporate new slip roads to and from the southbound A9. This will remove right turns into Bankfoot to and from the A9 improving safety and traffic flow on this vital road for local communities and the northern economy as a whole. "The local community will be delighted that this project is moving towards the next stage. This investment will improve safety for all users of the A9 and particularly for local residents in Bankfoot. "This Scottish Government is committed to providing a first class transport network which will support and grow our economy. This project plays a vital part in the delivery of our vision, bringing benefits not just to the North, but to the whole of Scotland." Subject to the successful outcome of the statutory process, it is estimated work will start in Autumn 2008 taking around six months to complete. The Scottish Government is paying for a trial scheme to beam anti-drink adverts directly into X-Box games across Scotland. The adverts will appear on virtual billboards within the games consoles that thousands of young Scots are expected to receive as Christmas presents. Transport Minister Stewart Stevenson said that with latest statistics showing an increase in road fatalities, it was time to look at innovative solutions. "With latest statistics showing an increase in road fatalities, particularly amongst young people, we must look at new ways of getting road safety messages across. Xbox road safety campaign"This is exactly the kind of initiative we should be trying. It is innovative, it is new, and it is far removed from the more traditional methods we have been using. I believe that is what we need if we are to reverse the number of Scots families suffering the tragedy of a loved one being lost. "Our road safety initiatives are being heard, but there are some who are still ignoring those messages. Many are paying with their lives. "This is a huge opportunity to try and reach a new audience - 73 per cent of UK 15-24 year olds have access to a gaming console in their home. The technology is non-intrusive, subtle, but the message can be seen in the background, loud and clear. "We will monitor the results of this trial, but I hope it can be a success. With Christmas approaching, and many young people unwrapping new consoles, this initiative has the opportunity to save lives across Scotland." "We need to look beyond the conventional methods of addressing key road safety issues which affect young people, and I believe that positioning of the drink-drive message in online games will serve as an ever-present reminder to young Scots about the consequences of doing. What many don't realise is that, when caught drink-driving, they will lose their licence - they're LOS 3RS - and the online message could not be any simpler 'Don't risk it'". The project will cost £10,000 and will initially transmit anti-drink drive messages. However, if successful, the technology can deliver any road safety message needed directly into any game. Some of the games to carry the ads will be: Need for Speed: Carbon, Need for Speed:proStreet, Project Gotham Racing 4, Pro Evolution Soccor 2008, NBA Live. Parliament today voted overwhelmingly in favour of the 'Abolition of Bridge Tolls (Scotland) Bill'. The Bill will now go forward for Royal Assent. It is expected that tolls will be removed early next year on both the Forth and Tay Bridges. "This is a great day for the people of Fife, Tayside and the Lothians. This was the first Bill the new Scottish Government introduced when we came into power, and it is the last piece of parliamentary business of the year. "The start of a new year will bring an end to years of injustice. By February 14, no-one will be paying tolls over the Forth and Tay. I am sure people across Scotland will be delighted." Banff & Buchan MSP Stewart Stevenson has welcomed the announcement by John Swinney, Cabinet Secretary for Finance, that Aberdeenshire Council will receive £374.744 million next year from the Scottish Government. “This is welcome news for people in Banff & Buchan. I am delighted to see that under the SNP Government devolution is extending beyond the Scottish Parliament to local government level. “The Scottish Government, in making this announcement today is supporting Aberdeenshire Council to deliver key local and national services to benefit people across the area. “Under the SNP the council’s funding will increase by 4.6% in Aberdeenshire. “I urge the Council to confirm that with this money they will freeze the council tax and avoid the 3.5% rise that would otherwise land on people’s doorsteps next year. “People across Scotland suffered the weight of a 60% rise in Council Tax for over 10 years under Labour with the support of their LibDem allies. “It is unfortunate that Labour, instead of welcoming this deal, are scaremongering, especially among vulnerable groups. The SNP Government is increasing the funding available for people with disabilities, mental health issues and victims of domestic violence amongst others. “The SNP Government is taking action to ensure Aberdeenshire Council can meet all their commitments to people in the area and that local authorities have the financial freedom to respond to the needs of their local community. 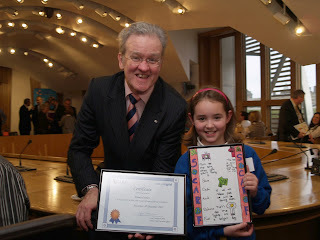 Banff & Buchan MSP Stewart Stevenson has attended an awards ceremony in the Scottish Parliament organised by Save Cash and Reduce Fuel (SCARF) in which a number of school children from the North East participated. SCARF, a company established to promote sustainable use of energy and tackle fuel poverty held a presentation of awards to winners of their 2008 Energy Efficiency Calendar Competition. The competition attracts around 4000 entries from primary school pupils, who are asked to submit illustrations which raise issues in relation to energy efficiency in the home. Mr. Stevenson congratulated local prize winner, Emma Findlay from Clerkhill Primary School, Peterhead and met with representatives of SCARF to discuss the issue of energy efficiency and the challenges of fuel poverty faced locally in the North East. 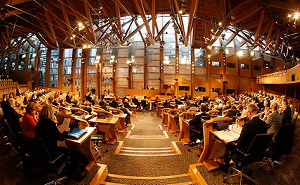 “I was delighted to see SCARF bringing its vital message of domestic energy efficiency to the Scottish Parliament. Fuel poverty is an issue of great concern, particularly in the North-east and one which I am happy to see the SNP Government is tackling with practical measures like the extension and improvement of the Central Heating Programme. “The awards ceremony was an extremely positive event binging young and old together to celebrate the hard work put into the calendar by the winning pupils, but also to push the issue of energy efficiency in the home to the fore. “The Energy Efficiency Calendar has a very wide circulation and I was extremely pleased to see that one of my constituents had succeeded in having her illustrations published in this year’s edition. I extended my sincere congratulations to the winner from Peterhead who has represented her area in an outstanding fashion and should be very proud. Fresh moves to re-establish a ferry service between Campbeltown and Ballycastle took a step forward today when Transport Minister Stewart Stevenson announced to Parliament that a new economic appraisal of the route is to be undertaken. Following talks with his Northern Ireland counterpart Nigel Dodds MP, Mr Stevenson said that Ministers have agreed to jointly fund work into the case for restoring the service using the Scottish Transport Appraisal Guidance (STAG) system. "After years of no movement on a Campbeltown-Ballycastle service, I am delighted to announce that I have agreed with Northern Ireland Minister Nigel Dodds to carry out a fresh economic appraisal of the route. "Communities on both sides of the water have campaigned long and hard for the reinstatement of this service, believing it would bring economic and tourism benefits to the local communities involved and Scotland more widely. "This appraisal will examine that case. "Both Governments are in agreement that the previous appraisals carried out in 2000-01 are now too old to be of any practical use in assessing the case for reintroducing the service, or estimating the associated costs and benefits involved. A new appraisal now will allow us to re-examine the economic viability of the route. "The STAG appraisal will be completed this summer, and at that stage, we will agree with our colleagues in the Northern Ireland Executive, the next steps to be taken. "The Scottish Government has set aside funding within the budget announced by John Swinney last month for a Campbeltown - Ballycastle ferry service, and we remain absolutely committed to doing all we can to progress this for the local communities involved." The STAG appraisal of a Campbeltown-Ballycastle ferry service will be completed by summer 2008. During the First Minister's visits to Belfast on 18/19 June, and at the British Irish Council on 16 July, Northern Ireland Ministers indicated their willingness to work with the Scottish Government to consider ways in which the project might be taken forward. The Scottish Government and the Northern Ireland Executive agreed to examine the case for restoring the ferry service. Since then officials from both administrations have discussed joint working arrangements for taking the project forward. The Transport Minister has discussed with his counterpart in Northern Ireland, Nigel Dodds MLA MP, at the end of November. During that discussion, it was agreed that a fresh economic appraisal, using the Scottish Transport Appraisal Guidance (STAG) should be undertaken. This STAG appraisal will allow both Governments to assess the economic viability of the route. It will also allow us to identify the preferred ferry service option, together with the key terms of a service specification, which might be used for a future tender exercise, and a detailed review of the vessel availability. Banff & Buchan MSP Stewart Stevenson is encouraging local people to submit nominations for the annual Scottish Countryside Alliance ‘Best Rural Retailer’ awards. The competition showcases the rural enterprise, produce and community spirit of Scotland. The awards aim to recognise and celebrate Scotland’s small independent retailers, who often act as ambassadors for their communities as well as promoters of local produce. “Here in Banff & Buchan we are fortunate to have some of Scotland’s best independent producers and retailers. Think of almost any type of food, and you will find that we are blessed with our own local producers –fish, beef and farm vegetables to name just a few. “I am a strong supporter of our rural retailers and believe that, with the backing of local people, they will have a strong chance of gaining national recognition through these prestigious awards. Nomination forms can be obtained from telephoning the SCA office on 0131 335 0200 or can be made online at www.bestruralretailer.co.uk. The closing date for nominations is 6 October 2007. These are the third annual Countryside Alliance Best Rural Retailer awards. The nomination phase closes on Saturday 6 October 2007 and regional judging will then take place. Scottish winners will be announced in December and four UK winners will be named at a reception in the House of Lords in February 2008. Extensive upgrades to facilities and major habitat restoration work will feature at special open day and launch event for one of north east Scotland's most impressive nature reserves. Visitors to RSPB's Loch of Strathbeg this Saturday 29th September will be able to watch up to 40,000 pink footed geese roosting on the stunning restored and diverse habitats surrounding Britain's largest dune loch, all from the refurbished comfort of a completely upgraded visitor centre. Wildlife enthusiasts or those just curious about nature will also have the opportunity to get involved in multiple activities on the day, including guided walks, wildlife tracking, pond dipping, bird watching, beach clean events and demonstrations by the British Divers Marine Life Rescue charity. Stewart Stevenson, SNP MSP for Banff and Buchan, will officially launch the new facilities and have a personal tour of the new facilities and habitat improvements at the reserve on the day. More than £1 million has been spent during the past two years undertaking extensive habitat restoration and improvement works to upgrade the condition of the reserve habitats that play host to a multitude of birds, mammals, insects and plants. Funding for the work has been provided through European Regional Development Fund via ESEP (£480k), the National Lottery through The Heritage Lottery Fund (£367k), Scottish Natural Heritage (£150k), the Gillman Trusts (£20k), the Friends of Strathbeg (£20k) and by Shell UK(£6k) for education projects on the reserve. Formed in the early 1720s, the 206 hectare loch and surrounding 1,052 hectares of reserve lands are a haven for wildlife, with 260 species of bird having been recorded at the site in addition to mammals such as otters, water voles, waters shrews, insects including more than 18 species of butterfly, 280 species of moth and more than 300 plant species. However, the freshwater loch system has over the years been progressively collecting silt due to historical water management before RSPB purchased the reserve. This was degrading the ecological condition of the loch, but the works have allowed this to be stopped, along with other measures to rejuvenate the diverse habitats on the reserve and make them more suitable for the many species which live there. New reed beds have been established, the main feeder burn into the loch has been re-routed to its original course, silt traps have been installed, and water control systems built that will allow reserve staff to maximise the potential of reed and wet grassland habitats for breeding waders and wintering wildfowl, particularly pink footed geese, which can number up to 80,000 on the reserve in winter as they pass through and refuel on their southward migration. Together with whooper swans, ducks including wigeon, teal, shoveler, pintail, and pochard, approximately 40,000 pink footed geese remain at the reserve throughout the winter months, a truly amazing spectacle. The last remaining island on the loch has also been stabilised and another that was lost in the 1970s has been recreated to preserve suitable habitat for breeding terns and gulls in the summer, and 26 hectares of willow scrub has been removed. In the visitor centre new interpretation boards have been installed revealing fascinating information on the species that can be seen, and a 3x2 metre painting by a local artist Kath Hamper has been hung on the wall. An interactive play area has been created for children, and a camera and TV screen will be installed in the next few weeks to beam live pictures of bustling bird communities on the reserve direct into the comfort of the visitor centre for those cold and wild days when the comfort of an armchair and hot drink are preferred. Two new wildlife observation hides have been built and relocated to optimise wildlife viewing opportunities and cut down visitor journey times between hides, and another existing hide relocated. "I am delighted that the RSPB has now completed the restoration and upgrades to the habitats and visitor facilities at the Loch of Strathbeg. Inspiring places like this, where Scotland's precious natural heritage is on show and positively promoted to the public, are vital in helping people realise the true benefits that this can bring to the region, both economically and socially. It is a pleasure and a privilege to be able to re-launch Strathbeg nature reserve." "Together with all the superb habitat restoration works, the upgrade to the visitor facilities here means that the fascinating Loch of Strathbeg experience is accessible to absolutely everyone - and not just the serious bird watcher. Families can come and spend a few hours taking in the unique and boisterous drama of one fifth of the world's population of pink footed geese taking flight in synchronised unison. There are also plenty of other amazing wildlife spectacles to me remembered and treasured for months. "The Loch of Strathbeg is a truly inspirational slice of natural heritage that would surely be close to the top of any national league table. We just hope that people all over Scotland, but particularly in the north east, will now come and visit and that we can help them to realise the incredible value of our natural heritage and their right to enjoy, cherish and protect it." For more information/interviews/images, please contact RSPB Scotland’s Head of Media James Reynolds on 0131 311 6500 / 07725065186. RSPB's Loch of Strathbeg nature reserve is roughly ten miles north of Peterhead, near Crimmond, just off the A90. The Loch of Strathbeg formed in 1720 following a storm blowing a sand bar across the channel feeding into the sea. At 206 hectares it is the largest dune loch in the UK. It has a shallow depth range between 0.75 and 1.25 metres, although in times of drought or flood can vary. With 260 species of birds, 280 species of moths, more than 300 different species of plants, 18 butterflies and more than 20 species of mammal, the reserve is a haven for wildlife and a spectacular place to watch nature at all times. Historically the freshwater loch water was crystal clear, with leaping brown trout and rich beds of stonewort. However, this changed in the late 1970s and 80s when local agricultural systems intensified, leading to excess fertiliser nutrients running off from surrounding farmland. This 'diffuse pollution' caused eutrophication in the loch system, leading to massive algae blooms turning the loch a soupy green. As a result the stonewort beds and brown trout disappeared. The project works were the first phase of action to redress this issue by cleaning water from the Savoch Burn - the main stream in-flow to the loch system - before it reaches the Loch. This has involved planting a reed filter system and a silt trap. The Savoch Burn has also been 'naturalised' - returning it to its original 1.8km meander rather than a 1.2km canal route to the loch, and significantly slowing the flow rate into the loch from 2-3 hours to 2-3 days. This should reduce the diffuse pollution. At times of flood the burn will over-top along its whole length and spread through the newly-created 23 hectare reed bed combined with the silt trap which will allow suspended material to settle out prior to entering the loch system. In addition a network of water control structures have also been established that allow control of water levels within the Savoch Burn area, reed bed and adjacent wet grassland to maximise their potential for breeding waders and wintering wildfowl, particularly pink footed geese. 26 hectares of mainly scrub willow has been removed from an area of open wet fen that was in an unfavourable condition due to the encroaching woody vegetation. The last remaining island on the loch has been stabilised, and an island that disappeared in the 1970s has been re-established to provide suitable habitat for breeding seabirds, notably common terns. The loch is presently classed by SNH as in unfavourable condition due to the water quality aspect of the habitat which the completed works are aimed at redressing. RSPB has commissioned a Loch Assessment that will investigate the situation with the nutrient rich silt in the loch and its in-flows, producing a range of options to remedy the problem. Being a shallow loch, any strong winds churn up the loch bed and re-mobilise the silts, allowing a fresh dose of nutrients to become active again. The assessment will produce a range of costed options from the do-nothing option to the full scale silt removal option via dredging etc. If we can start the process of whole-scale restoration we can, over time, return the loch not only to favourable condition, but to bring back the classic description of a system with crystal clear water with a sandy loch bed covered with beds of stonewort and leaping brown trout. 2006's hugely successful Goosewatch programme of guided walks and talks will return in 2007. Join staff one hour before sunrise throughout October and November to experience one of North East Scotland's most impressive wildlife spectacles. Hear about and witness the lives of tens of thousands of pink footed geese as they lift off into the skies above the reserve. Dates for 2007 are: Wed 17th Oct, Sun 21st Oct, ?Wed 24th Oct, Sun 28th Oct, Wed 31st Oct, Sun 4th Nov, Wed 14th Nov, Sun 18th Nov, Wed 21st Nov.
Adopt-a-beach (Marine Conservation Society) beach clean initiative. 10am, St Combs Beach below Tufted Duck hotel. Guided beach walk with British Divers Marine Life Rescue seal and dolphin stranding demonstration (please note there will be no live animals). 11.30am and 12.30pm. Wildlife Tracks and Signs guided walk. (30 mins) A hands on activity for all the family to learn useful tips about identifying the signs indicating what wildlife passed by before you. 12.30, 2 and 3.30 pm. Farmland Birds under threat. (30 minutes). A guided walk to search for, identify and learn about some of our most threatened farmland song birds and waders. 12pm and 1.30pm. Guided birdwatching in Tower Pool hide. 11am to 3pm. Observe the reserves thousands of geese, water birds, raptors and other species with staff on hand to help identify and spot the more elusive birds and wildlife. To book a place on any of the walks or for more information on the forthcoming Goosewatch, please contact Joanna McFarlane on 01346532234 or email jo.mcfarlane@rspb.org.uk. For Goosewatch, members are free. Adults £2. Children £1. Places are limited, so book early. Proposals for an alternative to the previous Edinburgh Airport Rail Link (EARL) project were today set out by the Scottish Government and approved in Parliament. Transport Minister Stewart Stevenson vowed to provide good public transport access to Edinburgh Airport in order to encourage fewer people to drive there. He also stated that the proposals will be delivered for a fraction of the cost of EARL project and without high risk. "The planned EARL project was hugely complex and demanded clear and co-ordinated project management. The June Audit Scotland report told us that the project did not have this. Key stakeholders confirmed this position and it is clear that no agreement had been reached on the most effective way forward to deliver EARL. "In particular, none of the key stakeholders were willing to take responsibility for the risks associated with the construction of the tunnel. That would have meant tax payers having to take on an unlimited risk. A risk that this government is not willing to take. An Edinburgh Airport rail link cannot proceed in its original form. "The proposals approved by parliament today will provide good public transport access to Edinburgh Airport to encourage fewer people to drive there. It will also be delivered for a fraction of the cost of the EARL project and without high risk. "EARL was estimated to cost more than £600 million. The proposals approved by parliament today will be delivered for around £200 million - less than a third of the cost." The Minister also set out plans for a ten year investment programme setting out how the government intend to enhance the rail network across Scotland in line with the High Level Output Specification. This would involve the electrification of the Edinburgh to Glasgow route, with benefits for the environment, performance for the passenger and lower operating costs. It is planned that this will include up to six trains an hour on the Edinburgh/Glasgow train route, with express services travelling from city centre to city centre at a journey time of around 35 minutes. Including investment in other central Scotland routes this could mean as many as thirteen services between the two cities every hour within ten years. HLOS was announced in July in parliament and today's statement is in line with Minister's Scottish rail priorities. A six year contract to operate lifeline ferry services for the communities of the Clyde and Hebrides has been awarded to CalMac Ferries Ltd. The award means that the new contract securing these vital services will commence on October 1, 2007. "We are determined to maintain and improve Scotland's ferry services. "This contract award secures lifeline ferry services across the Clyde and Hebrides. "These ferries provide a vital link for goods and services to be transported to our remote and island communities, sustaining their economies. For these communities, a reliable ferry service is just as important as a new road or rail link in a large town or city. In fact, many would argue that it is even more important than that, as it is their only link to mainland Scotland and beyond. "The CalMac bid has been closely scrutinised, and the contract incorporates some important service enhancements. This contract will deliver real improvements for all passengers using the services. "I am aware of the strong feelings around the need for this tender, but completing the process was the quickest way to protect these vital services for those communities who depend on them. "The new Scottish Government is looking at the fares structure for ferry services. We recently commissioned a study into Road Equivalent Tariff, making clear our desire to deliver a fairer deal for Scotland's ferry passengers." The tender process began in October 2005 and has been the subject of two consultation exercises to finalise the service specification. The contract being awarded is a six year block grant public service contract under the terms of the EU Maritime Cabotage Regulation and the EU Guidelines for State Aids in the maritime sector. V-Ships UK Ltd and CalMac Ferries Ltd were invited to tender in December 2006. V-Ships UK Ltd withdrew from the process in January 2007 leaving CalMac Ferries Ltd as the only bidder. The bid was subject to a robust and thorough evaluation by the Scottish Government assisted by independent financial, legal and maritime technical experts. The contract, which will be worth £43 million in subsidy in year 1, will commence on October 1, 2007. CalMac Ferries Limited, a wholly-owned subsidiary of David MacBrayne Ltd, will operate the services. David MacBrayne Limited is in the ownership of Scottish Ministers. The budgeted subsidy for the first year of operation is £43.0 million, subject to adjustments as necessary in the light of actual inflation and other factors provided for in the grant agreement. Thereafter, the subsidy will be calculated according to the terms of the detailed grant agreement, which was issued in draft to the two companies invited to tender for the contract. The evaluation of CalMac Ferries Ltd's bid has been rigorous and thorough and has followed two strands - technical and financial. CalMac Ferries Ltd's technical bid was fully compliant, robust and technically acceptable and clearly reflected their expertise and wealth of experience in operating these lifeline ferry services. Likewise their financial bid was financially robust and provided value for money. Overall their bid demonstrated the company's ability to continue to deliver the lifeline ferry services in the Clyde and Hebrides area. The contract will begin on October 1, 2007 and run until September 30, 2013. Banff & Buchan MSP Stewart Stevenson today pledged his full backing to local farmers in Banff & Buchan in the wake of the recent re-emergence of Foot and Mouth disease in Surrey, England. The Scottish livestock industry had only just got back on its feet from the summer outbreak before last week’s blow. “The Scottish livestock industry has been left reeling since last week’s re-emergence of Foot and Mouth in Surrey. I am fully committed to supporting the farmers of Banff & Buchan in order that the impact of this latest outbreak can be minimised as much as is possible in the circumstances. “This second outbreak in a matter of weeks is very serious news indeed for the industry as many of my constituents, as with farmers across Scotland, have been forced to cope with a significant backlog of work as a result of the summer outbreak. It is of immense importance that this second outbreak does not ruin the livelihoods of those involved in the agricultural industry. “Since speaking to local farmers I have been, and will continue to be, in direct contact with the Secretary for Rural Affairs in order that he can be kept up to date with the concerns of those impacted on the ground.